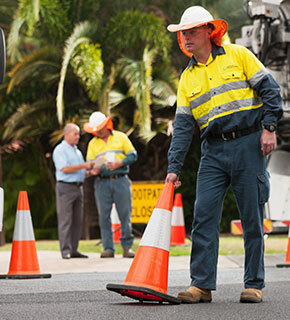 Safety comes first when working on or near our water and sewerage network. We coordinate all works to ensure the safety of contractors and minimise impacts of taking services offline for our community. What is a Network Access Permit? Before beginning construction, you will need to apply for a Network Access Permit (NAP) which allows you to work on or near our network. Download the Pre-Construction Package Form (Live Works - Job Plan) (PDF). This must be completed by a licensed plumber. We will issue your approved Network Access Permit via email within ten business days of a properly made application. Twenty business days may be required if works impact the sewerage network and a Flow Control Plan is required. Please take this into consideration when planning live works. Each permit has general conditions as well as conditions specific to your development, and will advise if a shut plan or flow control plan is required. Shut Plans are typically required if a hydrant is being installed, or the new water main or service is 100mm or larger in diameter. It is a condition of every shut plan that a trial shut must take place. Flow Control Plans are typically required if the existing sewer main or service is a rising main, pump or 160mm or larger in diameter. We create shut plans based on as-constructed drawings available in our Geographic Information System (GIS) system. In some cases, this information may not be as current as your records, including engineering designs or first-hand site information. If you are working on an old or brand new section of our network, we recommend you attach a mud map or mark-up of the design to your Network Access Permit application to help us create an accurate shut plan. provide the opportunity to resolve potential issues prior to time of construction, so you have no surprises on the day of connection. If you discover an issue with our network or a shut plan during the trial shut, we will investigate and trial a revised shut plan at no cost until an accurate plan is identified. Book one of our accredited valve turners, as no other companies are permitted to turn valves on our network. Provide three business days’ minimum notice to impacted properties. Engage critical customers, identified by Queensland Urban Utilities, to determine arrangements and requirements during a trial or water shut. This includes large commercial properties such as hospitals, schools and manufacturers. This is a crucial step in the scheduling of your works. See our Network Access fact sheet (PDF) for more information on shut plans.